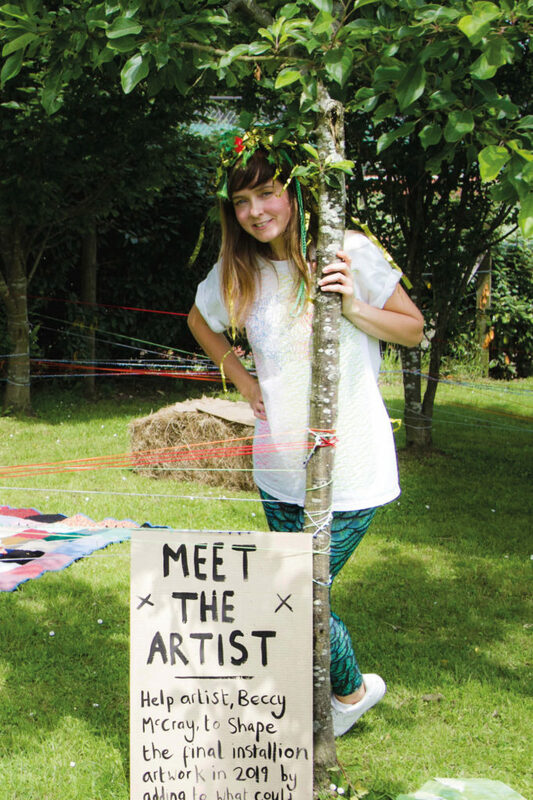 Hastings-based artist Beccy McCray got Wadhurst talking on Sunday 10th June, when she launched her latest participatory arts project, ‘When the Oak Spoke’; an initiative commissioned by local arts charity, Wadhurst Culture. Over 250 attendees of all ages enjoyed a sun-filled event at Sparrows Green Pavilion and Recreation Ground, taking part in a range of activities, from talks to ‘poet-tree’. Focusing on the oak tree that has been so important in Wadhurst’s history, and is still so present in the landscape, Beccy is working towards an installation artwork in local woodland next spring. This will not only explore her own response to the way trees communicate via the wood wide web but also include ideas emerging from community activities that encourage an artistic dialogue between the local residents and these grand trees, giving the oak a voice and raising awareness of conservation issues. Beccy’s ambition is ‘to spread joy and inspire positive change at grass roots level’ and her design for the launch event did just that, with its colourful, festival feel. Employing her trademark approach to community art, visitors had a chance to engage with new ideas and express their own creativity. Activities included a programme of talks, including an exploration by local historian Heather Woodward on how the oak had ‘spoken to’ and shaped Wadhurst through the ages, and an investigation into what trees are trying to tell us today with ecologist and conservationist, Luke Wallace. Hastings-based writer and poet Emma Joliffe helped visitors write ‘poet-tree’ in a specially designed wooden den, while Rixy from Embers Collective entranced spectators with the folklore of trees. Experts from the Woodland Trust conducted walks around the local trees, opening up a wealth of unexpected information, and giving advice on how to age an oak. And it was all brought together with tree-themed music from community choir ‘Wadhurst Aloud’, mask-making with oak leaves, delicious food from ‘Eat what you Sow’ and books from Barnett’s Bookshop. There were even acorn flour biscuits to try. The oak certainly spoke to Wadhurst that day and we await the next stages in this collaboration. • Or you can watch the project grow by following whentheoakspoke.tumblr.com or #WhenTheOakSpoke. 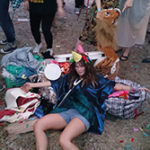 Jumble Sale & Daytime Rave! !